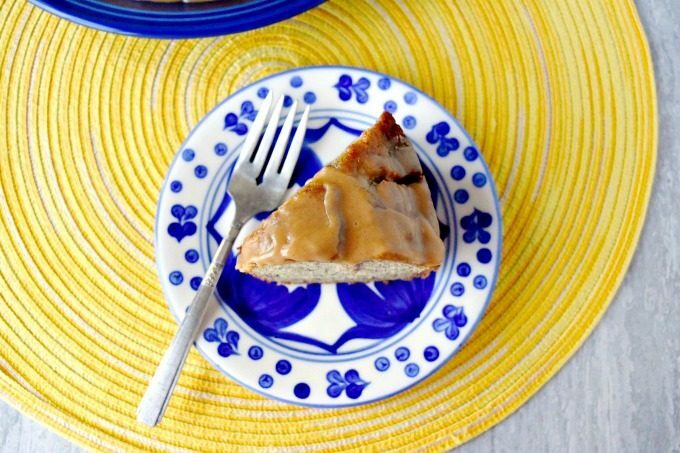 Your picnic guests will not be able to get enough of this Banana Snack Cake with Peanut Butter Glaze. We used to picnic often when I was growing up. When we first moved to area, my family didn’t have a lot of money. So, Mom would find all the free events we could attend and places we could go to keep us girls entertained. That meant packing a cooler and a blanket, setting up on a lawn of some sort, and have a home cooked dinner while watching famous singers and songwriters perform, watching a military tattoo perform a rifle drill, or take a walk through a historical park. I’ve seen Navy and US Marshalls perform military drills and perform music both singing and symphonies. I’ve watched cavalry exhibits at the Patriot Center. I’ve seen the changing of the guard for not only the Tomb of the Unknown, but also in the Capitol Rotunda as a soldier lie in state. No, not all of these events were picnic worthy, but many of them were. I’ve picnicked on the Capital lawn, the Lincoln Memorial, Iwo Jima, and countless other spots throughout Washington, DC. You’d be surprised where you can set up a blanket for a picnic. Our cooler was usually packed with tea, cheese and crackers or chips and dip, fried chicken, pasta salad, or coleslaw, and occasionally dessert. Sometimes it was pudding cups, cookies, or brownies. Sometimes there was pie, but not often. There usually wasn’t cake. And definitely nothing with banana. Dad didn’t like bananas. He still doesn’t. When he was a kid, his father worked in a grocery store. Well, we all know how bananas go bad. I guess Papa brought them home all the time for Nana to bake with, cook with, or just plain eat. Dad ate one too many when he was a kid, I guess, and just doesn’t like them any more. Me, on the other hand, they used to call me monkey. I love them. I can’t get enough of them. I’ve made banana pudding, pudding pie, bread, muffins, waffles, foster, pudding pops, and burritos. Banana pudding has a special place in my heart. I’m sure I discuss that in the pudding pops recipe. You’ll have to read it. At any given time, I have at least 3 bananas on the counter and at least 10 in the freezer. You see, when they start to turn and get over ripe, I stick in the whole in the freezer to save for baking with later. This serves two purposes. First, it keeps them from completely rotting and I can cook with them at any time. I mean, the skin alone is the perfect “wrap” to keep them from getting freezer burned. Secondly, when you thaw the banana, you don’t have to mash it before adding it to your wet ingredients in any baking recipe. When they’re frozen and then thawed, they turn into a banana mush. This makes them perfect for baking! There’s no pre-mashing needed. I simply tear off the end, squeeze the banana out of the skin, and beat with the hand mixer into the wet ingredients. It looks like caramel, but it’s all peanut butter. And the glaze is totally addictive! I couldn’t stop tasting it. 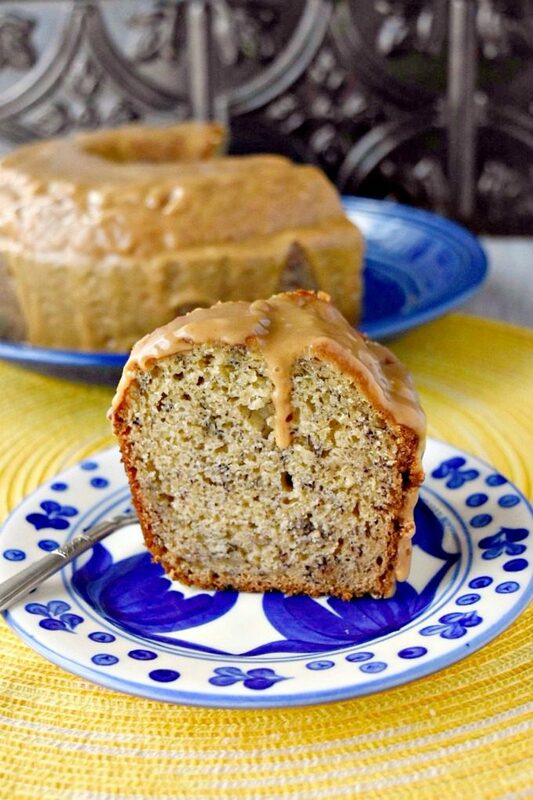 I had to get the flavor JUST right to go with this moist and delicious banana cake. I know it sounds sort of strange, but this cake really does tasty delicious chilled. I don’t know why, but I had a piece in my lunch box for work. I needed a mid-morning snack and started to nibble on this cake. Chilled. Next thing I know, I’ve eaten the whole piece! No, I don’t feel bad eating this as a mid-morning snack. It’s low in fat and full of banana fiber and deliciousness. Of course, my piece for lunch didn’t have the glaze on it. I didn’t glaze it until the weekend. SO, it really was glorified banana bread that was incredibly moist and delicious. After the hubs tasted the glaze, he couldn’t wait to have this cake. Which is totally unlike him. I’m sure I’ll wind up taking half of it to work, but I’m okay with that. It’s delicious. I’ll either eat it as a snack or it will vanish as soon as I release it into the wild of the entry table by the main door. You put things there and they just vanish. It’s amazing. And I know this cake wouldn’t take long to vanish. It has amazing banana flavor. It’s not overly sweet but is definitely moist. The peanut butter glaze truly rounds out the flavors for me. I’m a total sucker of peanut butter and banana together. It’s one of my favorite comfort foods. Have you served up cake at your picnic before? Combine the flours with the baking soda, baking powder, and salt. Stir with a whisk and set aside. Combine the butter with the sugar in a mixing bowl and beat until light and the sugar has dissolved. Add the vanilla extract, eggs one at a time, and yogurt; stirring to combine after each addition. If your bananas are not overly ripe, mash with a potato masher before stirring into the sugar mixture. Beat with the mixture until the bananas break down and become smooth. Add the dry ingredients to the sugar mixture and beat until just combined. Spray a bundt pan with cooking spray. Pour the batter into the pan. Lightly tap the pan on your work surface to even the batter out and release any air bubbles. Bake at 350 for 35 to 40 minutes or until a toothpick inserted in the center comes out clean. 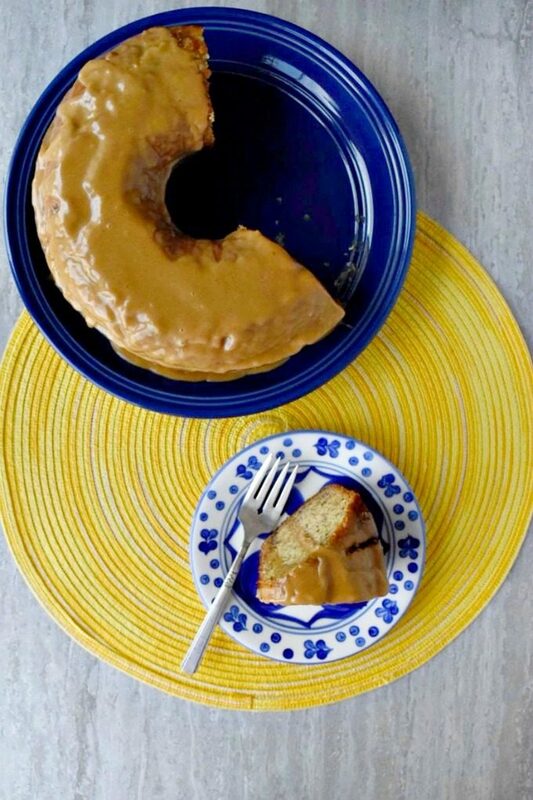 While the cake is cooling, combine the remaining ingredients (peanut butter powder through powdered sugar) in a small mixing bowl with a whisk. Stir until combined and the sugar has melted. Set the cake over a cooling rack on top of a baking sheet. Slowly pour the glaze over the cake and allow to set. If needed, move the rack to another baking sheet and spoon the excess glaze over the cake. Love the flavors and it looks delicious too! Thank you! It was rather tasty. Bananas and peanut butter is one of my fav combos! This cake sounds so good! Thank you! I hope you enjoy it. It is moist and delicious. I could’ve been called monkey, too =) Thank you for your tips about frozen bananas. Appreciate the scrumptious recipe and your splendid hosting of today’s Sunday Supper! Thank you for all your kind words! I love freezing bananas to save for later. So easy. 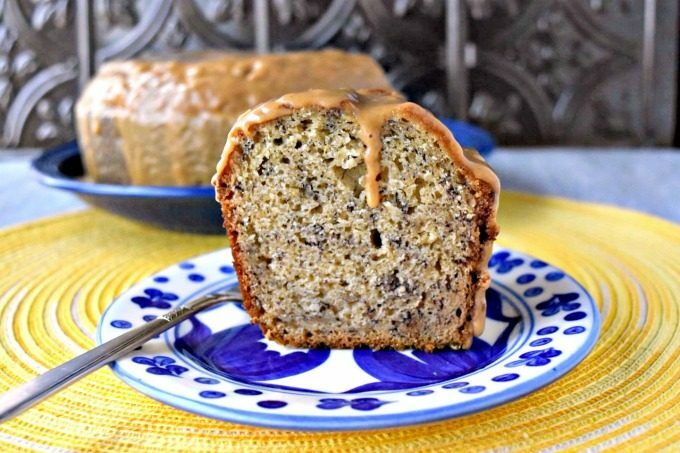 I feel like we always have extra bananas and can’t wait to try them in this cake! I so love a banana cake and that glaze is calling my name! I have got to give this a try! I hope you like it! The hubs couldn’t keep his fingers out of the glaze bowl. Peanut butter and banana are one of my all time favorite combinations. This cake has my mouth watering. It is mouth wateringly good with the PB and banana combo.